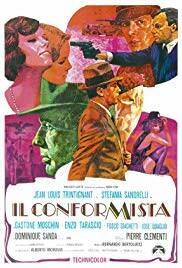 The Conformist is a 1970 political drama film directed by Bernardo Bertolucci. The screenplay was written by Bertolucci based on the 1951 novel The Conformist by Alberto Moravia. The film stars Jean-Louis Trintignant and Stefania Sandrelli, and features Gastone Moschin, Enzo Tarascio, Fosco Giachetti, José Quaglio, Dominique Sanda and Pierre Clémenti. The film was a co-production of Italian, French, and West German film companies.